Someone associated with Frog God Games just posted on following on the Microlite20 message board. As the board doesn’t get much use, I decided to report the info here. I’m personally not that interested in voice chat, but I know many gamers are, so this may be news at least some old school players can use. 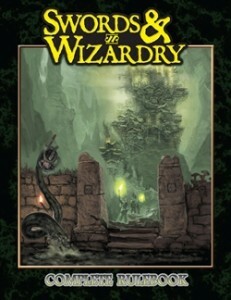 Frog God Games produces some very high quality (and often very expensive) stuff for Swords & Wizardry (and other games of much less interest to readers of this blog — like Pathfinder). Side Note: Normally, I’d consider a forum post like this “advertising without approval” and delete it, but I decided to not to be a complete jackass of a “forum GM” and leave it up. This should not be considered setting a precedent — it is always better to ask first when when comes to anything advertising related on the forum (anf most other forums, for that matter). Yesterday was the first meeting of what will hopefully soon become my next Sunday Game. Six potential players and myself met over all-you-can-eat pizza to discuss campaign and rules ideas. After several hours (and a lot of pizza and soft drinks) we’ve hashed out some ideas for my next old school campaign. It will be set in a version of the Judges Guild Wilderlands — the main differences from the Judges Guild “canon” will be religion and magic. Exactly where it will be set is still up in the air. People seem torn between starting in the City-State of the Invincible Overlord, starting in a smaller town, or starting in a sea port with pirates. There are two votes for each. Sigh. Religion: The campaign will have only one true deity (an incomprehensible “creator”) who interacts with the world and its people through thousands of demi-god-like avatars. While some of these avatars might be avatars of “evil” things like theft or murder, all are opposed to Chaos. Chaos is what is outside “creation” and seeks to swallow it up and destroy it (that is, return it to formless chaos). The main effect on the campaign is that there will be lots of little religions with most people praying to many deities depending on what they need. Clerical characters focus are more focused a single deity (but even they will pray to other Gods when they need help in their specific area of power. The game effects for clerical characters are that they can basically create the deity they want to follow and I will create 2 or 3 special prayers realed to that deity that their characters can access in the game. Clerical powers will tend to be low key because none of the thousands of deities worshiped inj the world are individually very powerful. Magic: According to legend, before an ancient world-wide magical disaster, people could easily wield very powerful magic by making a few gestures, saying incantations, and imposing their will on the magical energy of the world. However, people somehow pushed things too far and let Chaos into the world and there was a huge backlash of magical energy that ended this “golden age” of magic and somehow changed the very nature of magic. Now, very little can be accomplished magically with just gestures, incantations, and a mage’s will — most magic has to be performed through lengthy and often complex rituals. Mage characters will be able to do some “wand magic” (probably something like minor magic in my current Microlite75 Extended rules), but most magic will have to be done through rituals. Players will be able to design rituals to do anything from charming a being long term to moving mountains around. Of course, the more powerful the effect, the more steps needed to do the ritual (e.g. research, special items, special times, sacrifices, magical energy, etc.). Fighter: A powerful warrior class that gets +1 to hit and damage per level, is skilled at commanding men-at-arms, knows all sorts of special combat maneuvers and combat tricks, etc. Fighters will be able to design combat tricks on the fly and they will not be penalized for trying using them — if they critical hit, they do normal damage and impose the special effect from the trick, if they hit the defender can choose to accept the special effect or take the damage rolled. Highly skilled with weapons and armor. Scout: A lesser warrior (+1 to hit per 2 levels) who is also skilled in outdoorsman and some thief-like abilities. Normal skills with weapons and armor. Paladin: A lesser warrior (+1 to hit per 2 levels) who is also a priest/priestes of a deity. Paladins have a few standard prayers (healing, etc.) and a few special prayers determined by their deity. They can also repel/disrupt undead and some manifestations of Chaos. Normal skills with weapons and armor. Mage: A minor warrior (+ 1 to hit per 3 levels) who is a scholar able to easily weild magic. Mages can use wand magic and know how to create and perform magical rituals to best effect. Limited skills with weapons and armor. All classes will have the ability to try use scroll magic. Scrolls are ancient writings from before the magical disaster that contain magic energy and an incantation that will release their magical power when properly chanted aloud. The game rules themselves will otherwise be 0e to B/X like. Now all I have to do is write enough of the first draft of the new rules needed so we can start playing — Target date for the first session is August 6th. I occasionally receive email asking me how I manage to get so many players for my old school games — giving that most potential players aren’t familiar with them — or if they are familiar with them do not have a very positive opinion of old school play. Given that the basement gaming area of my new house in Ohio is finally available and I’m currently recruiting players in yet another area where I don’t know many people, this sounds like a good time to make a post on how I recruit players for my long-running old school campaigns. First, let me say that I really don’t have any good ideas for taking a currently existing group of players and convincing them to play in an old school campaign. In my 35+ years of gaming, I’ve never really done that. I never had a group of friends who are already playing tabletop RPGS and tried to convince them that they want to spend years playing in one of my campaigns. Instead of trying to convince a pre-existing group who are not playing old school games to play in my campaign, I simply recruit a group of people who want to play what I want to run. This is really my secret to success — I find people who want to play what I want to run instead of trying to convince an existing group to play what I want to run. Since I run an old school style game where players just tell me what they want their characters to try to do and I tell them whether they succeed, fail, or what to roll to find out what happens, I don’t need to limit my search to people who already know the game system I am running. This also means I don’t have to limit my search to people willing to buy and study the rules to play. Therefore, I can recruit people that many modern gamers would not have any interest in recruiting: people who might want to play but who aren’t interested in studying and learning hundreds of pages of rules just to be able to play a character in an “elf game”. That said, I spend most of my time telling other gamers about my campaign. I tell them that it is old school where they are playing normal people who may become heroes, not people who are already awesome heroes. I explain that my campaigns aren’t centered around combat encounters (or even encounters in general), but around exploring the campaign world, searching for and recovering treasure, and interacting with the world in character. I explain that player skill matters more than character skill — and that running headlong into situations without any playing and preparation will eventually get their characters killed. I tell people I I do not have a story to tell, but that I run a sandbox campaign where the players can choose to have their characters try to do just about anything and the the campaign’s story consists of what the players’ characters do in the campaign world. I’ll be honest, most people’s eyes get big and they quickly decide that they want nothing to do with my campaign. That’s okay, because I want people who want to play in my campaign. However, generally about one in every ten or fifteen people seem actually interested in maybe giving such a game a try, I tell these people when the game is (or will be ran). If they are still interested I tell them how to join the campaign mailing list (or you could use a private Facebook group, etc.) where they can see the rules, learn about the campaign, and talk to other players (or potential players). Once I get a couple of people who are definitely interested, finding more becomes easier and these new players often have friends who they think might like the game and tell then about it. Often these people who friends who do not play RPGs for some reason or another, but they think would like to play in a game where they don’t have to do anything but show up and say what they want their character to try to do. I generally want at least four players to start a new campaign. It generally takes me a month or two, at most, to get to that point from no players. I keep working a it even then, however, as I usually loose a player or two once the game starts due to time issues, the game not being quite what they expected, etc. Once I have a group playing, however, recruiting actually becomes easier and the current players and current game situation are generally better at generating interest then boring old me. Will this work for others? I will admit that it seems to work for me better than it seems to for others. I’m not really sure why. Perhaps it is because this is the way I’ve always done it and so have gotten good at it. I have been thinking about my next game design and after much thought, I’ve designed I would like to take 0e and “redesign” it with some different assumptions. where CB is Combat Bonus, ST is saving throw, WpnD is the damage they do in combat with any weapon, and Talents is the mundane skills they have. This means a 1st level fighter with (as currently planned) hit points of 1d6+8 and a CB of +3, a ST of 16, and a WpnD of 1d6+3 is already head and shoulders above a trained and experienced human warrior, let alone a normal farmer or merchant. Let’s look at what this means with regard to monsters. A normal human only has a 5% chance of making a saving throw, this means that monsters with special abilities are truely a terror to the normal population. A first level fighter will have a 25% chance of making their save which is five times better than the vast majority of the population. Most 1 hit die monsters will do at least 1d6+1 damage which means they do more damage than even a trained and experienced normal warrior. The least healthly first level fighter will have 9 hit points, that is 50% more than the most experienced normal human with combat training and 3 times the amount the average adult has. First level characters in this game will not be that much more powerful that first level characters in most OSR games, but because you will not normally have leveled characters as blacksmiths, innkeepers or villiage guardsmen, they are effectively (and noticeably) more powerful in the world. This means the 4th level fighters will truly be the heroes and 8th level fighters will truly be the superheroes that they were originally called in 0e. A week or so ago, I mentioned that I was playing in a D&D 3e game — a long running campaign that started as a 2e game in the early 1990s — and that the campaign avoided most of the many 3e problems discussed on forums because the game was played as if it were 2e and used a few house rules to fix some of the more obvious issues. Naturally, I was asked what those house rules are. So this campaign is the subject of today’s post. The most important reason for this campaign’s success with the 3e system (and note, it is 3e — not 3.5 or Pathfinder) isn’t the house rules, but the fact that the players and the GM play it as if they were still playing 2e. What does this mean? To start with, it means the group still has the 2e era zero-tolerance for players who are rules lawyers and/or min-maxers (now more tolerantly called “optimizers”). The rules as written are less important than the GM’s rulings, the setting integrity, the house rules, and common sense. This solves many of 3e’s issues without any house rules at all. After all, if you don’t have min-maxers looking for rules issues to exploit, many of 3e’s issues simply are not likely to come up at the table. Those that are stumbled on my accident are going to be handed by maintaining setting integrity or by a ruling from the GM. For example, an exploit that can be simply stumbled into without any min-maxing is the infamous (at least on 3.x discussion forums) bear summoning exploit where a druid always summons bears and all the bears are far more effective in combat than any fighter could be. In this campaign’s setting, however, druids are servants of “Mother Nature” and are granted their powers by “Mother Nature” to be used mainly in the protection of nature — just as they were in 2e. If a druid were to start summoning bears nearly every time combat is joined, chances are many of those combats aren’t going to be about protecting nature. Therefore, “Mother Nature” is going to eventually stop providing bears when the rules-exploiting druid tries to summon them. This simple solution works because in this campaign setting integrity and common sense trump the rules as written. While the standard 3e saving throw groups are used, they have been modified to work like they do in 2e. That is, they get better as you go up levels — and for magic, the level of the caster has no effect on the save. All spell-casters start with only a few randomly determined spells. The only way a spell caster gets more spells is to find them (in scrolls, books, etc.) in the game. Players cannot simply choose to know any spell in the spell lists. If a spell-caster is takes damage (or is otherwise distracted) before his spell goes off, the spell automatically fizzles. A concentration check is allowed to see if the caster retains the spell in his memory — if the concentration check fails, the spell fades from the caster’s mind. Fighters can move and still make a full attack. 3e open multi-classing is allowed with two restrictions: 1) You cannot take an additional class until you have at least 3 levels in all of your current classes; and 2) Prestige classes are the sole province of organizations in the campaign world and training to advance in those classes is only provided by invitation of the organization in question. In other words, the GM controls which prestige classes, if any, are available to a character. Skills (and especially skill rolls) are downplayed. For example, rolling without a reasonable description of what you are actually doing is simply not allowed. Skills effects are limited by common sense: Diplomacy, for example. If something is a task anyone could try with some chance of success, even those without the skill on their sheet can attempt it with a reasonable chance of success. Skills pointed per class have been modified. Many feats are modified. For example, any feat that RAW walls off some action that anyone should be able to attempt becomes a +2 bonus to the attempt for those with the feat. Some feats are eliminated or made harder to use (magic item creation feats, for example). Morale rolls, reaction rolls, wandering monsters, random treasure and the like were retained from TSR D&D. Character advancement is slowed down to closer to 2e speeds. That is, a year of weekly play with the same characters will generally see those characters reaching about 8th level. Healing has been modified to handle the higher hit points of 3e characters and monsters. There are no Magicmarts. Other than common potions and scrolls with very common spells, magic items are seldom for sale. I’m sure there are many other changes. However, as I said, when I’m playing in a game, I have little interest in rules that do not directly affect my character. I have to concentrate on rules when I GM, so when I get to play I just want to “be” my character and interact with the game world (and not interact with the rules any more than I absolutely have to). I have been really enjoying this game — much more than I thought I would when I was told it was 3e. Much of my enjoyment probably comes from the campaign and its old school style of play. Unfortunately, the GM’s work schedule is changing in May and the game will be moving to a day and time I cannot be available for. I can’t really complain, however. I will have had almost six months of playing — which is the longest time I’ve been able to play in — as opposed to GM — a campaign in many years.